Volunteers are a vital part of supporting Friends of Elizabeth II and Roanoke Island Festival Park. Volunteering is fun, educational, and vital to both organizations. Whether you’d like to become a part of the crew for the Elizabeth II, share the rich history of Roanoke Island and the Outer Banks, greet visitors, or immerse yourself in The Museum Store, there is a volunteer position for you! 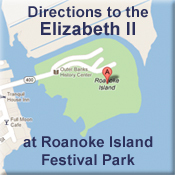 A variety of volunteer opportunities exist with Friends of Elizabeth II and at Roanoke Island Festival Park. Below your will find additional information about the various areas to volunteer for the Friends. The Museum Store – There are a variety of volunteer activities at The Museum Store, from greeting and assisting customers to preparing and tagging merchandise. Come join our team. Please join us by considering one the volunteer opportunities awaiting you. To be contacted about volunteering or receive additional information, complete the information below. You can add your volunteer interest in the Message field. Or you can contact Jaye Massecar at 252-473-3524 or director@friendse2.org.